Since the early 1980s and with increasing intensity in the past decade, geographic settlement patterns for the Latino population have been characterized by two trends: Even while Latinos have continued to concentrate in a handful of states where they have long been a major presence, other Latinos have dispersed to states where they are a new element of the population (Suro and Singer, 2002; Fischer and Tienda, 2006). In the traditional Hispanic states—so called because large shares of the Hispanic population have concentrated in them for many years—the impact has been measured in absolute numbers, while in the new settlement areas it has been measured in speed of growth. In California, for instance, the Latino population grew by 3.3 million from 1990 to 2000, an increase of 43%. During that same period, the number of Hispanics in North Carolina increased by only 300,000, but that marked a growth of 392%. The same patterns are evident in school enrollment. 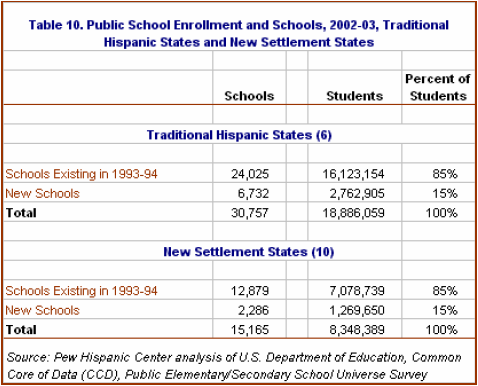 However, there are important differences in how traditional Hispanic states and new settlement states handled the relationship between enrollment growth and the creation of new schools. In sum, traditional Hispanic states were more likely than new settlement states to educate Hispanic students in new schools. For the purposes of this report, six states—California, Texas, Florida, Arizona, Illinois and New York—have been categorized as traditional Hispanic states. With 4.3 million Latino public school students in 1993-94, they accounted for 80 percent of all Hispanic enrollment. Over the next decade, the number of Latino students in those states increased by 2.1 million, or 48%. Public schools in traditional Hispanic states educated 76% of Latino students in 2002-03. Meanwhile, white enrollment in those states increased by 2,000, a statistically insignificant amount. Overall enrollment in the six states increased by 2.7 million, or 17%, and was accompanied by the creation of 6,732 schools, an increase of 20%. Ten states—North Carolina, Georgia, Virginia, Maryland, Nevada, Utah, Oregon, Oklahoma, Indiana and Kansas—are categorized as new settlement states. Those states had only 233,000 Hispanic students in 1993-94. Over the next decade, Latino enrollment increased by 181%. However, because it started from such a small base, the Latino total of 653,000 students in 2002-03 amounted to just 8% of the total Hispanic enrollment nationwide. Meanwhile, white enrollment increased by 50,000, or 1%. Overall enrollment in these states increased by 980,000, or 13%, and was accompanied by the opening of 2,286 new schools, an increase of 8%. School districts in new settlement states were less likely than districts in traditional Hispanic states to open new schools as enrollment increased. In the new settlement states, the addition of 980,000 students was accompanied by the opening of 2,286 new schools. Another way of putting it is that those states added schools at a rate of 2,342 schools per 1 million additional students. In the traditional Hispanic states, each additional 1 million students generated 2,4544 new schools. In both the traditional Hispanic and new settlement states, white enrollment in new schools increased while declining in existing ones. However, enrollment patterns for Hispanics differed. Traditional Hispanic states were more likely than new settlement states to educate additional Hispanic students in new schools (Table 11). Of a total increase in Hispanic enrollment of 2.1 million in the traditional Hispanic states, 37% of the additional students (762,000) attended new schools. Of a total increase in Hispanic enrollment of 420,000 in the new settlement states, 20% of the additional students (84,000) attended new schools.